All of our senses work by converting a physical force into an electrical signal that can be interpreted by our brains. For example, when we hear a sound, the small hairs inside our ears sense that disruption in the world around us and then transmit it into an electrical signal for the neurons in our brain which tell us what we are hearing. The exact processes that are going on when our body translates the physical signal to electrical signals is what these researchers are studying. Proteins perform many of the functions that happen in our bodies including transporting nutrients around, sending signals, and creating new cells. Each of these proteins is also encoded in our genes, like a recipe in each cell to design this protein where it is needed. The part of our cells that allow us to sense touch are special proteins that are called mechanically activated ion channels. Similar proteins exist in plants that help them to sense their environment and influence the root development based on soil properties or stem growth based on wind. Many of the exact proteins in plants and animals that sense different things around us have not been identified. These researchers discovered one of the genes that codes for a protein that is vital to our sense of touch. In order to test the cell response to types of touch the researchers used two methods. In one case they made a small indentation on the cell membrane with a glass probe. They also tested the stretching of the cell membrane by pulling on part of it. In each instance, they measured an electrical current that the cell produces in response to the disturbance to the membrane (Figure 1). Figure 1: Graphics of the indentation and stretching of the cell membrane. The researchers discovered two new proteins that exist in plants that they have shown are involved in sending signals when a deformation of the cell membrane occurs. They looked at the genes OSCA1.1 and OSCA1.2, which encode a protein that may be involved in sending signals. As a reference they used proteins found in mice that have been previously shown to send electrical signals under these same disturbances. The electrical signals observed can be seen in Figure 2. The signals observed from the two new proteins were stronger than the reference protein, PIEZO1. This means that the genes identified in this paper code for proteins that translate physical changes into electrical signals in plants. Figure 2: (A) Current detected by indentation of the cells and (B) by stretching of the cells. 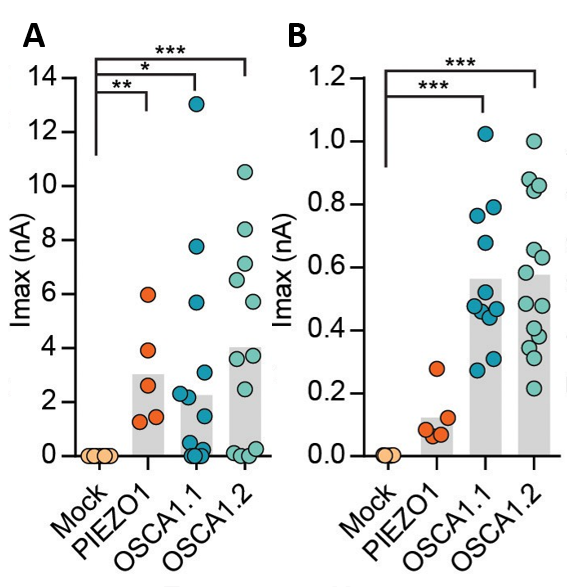 PIEZO1, found in mice, has been previously shown to send electrical signal based on this stimulation. OSCA1.1 and OSCA1.2 are first investigated here. In addition to looking at the two new proteins discussed above, the researchers expanded their search to include proteins produced by different plants in same family of species. 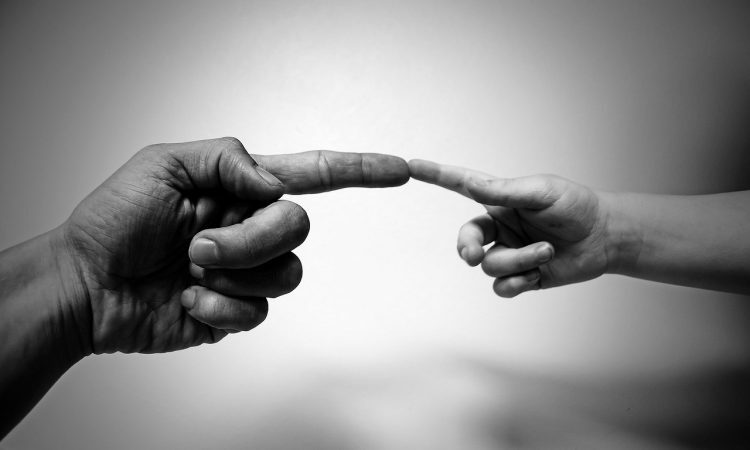 In the same family of species we might assume that the same protein is used for sensing touch across the family, but researchers found major differences! In fact, they found that the other cells respond to stretching but not indentation, whereas the first two proteins studied responded strongly to both types of touch. There is much more to investigate as to how the signaling protein differs between species that are even closely related. This discovery is exciting because it could help researchers better understand the structure of proteins that allow us to sense our physical environment. One area of study that is of interest to scientists is understanding how we sense pain, as this could help with pain management. In the future, scientists hope to further understand how these processes work and how our genes code for the proteins that allow us to feel touch and pain. This could also help us better simulate touch for artificial skin and prosthetics!